2. Add the sugar syrup (do not add sugar syrup if the lamb is not tender as it will not tenderlse further) and milk; mix well. Bring the mixture to the boil and cook for a further 5 minutes. 3. Bring 3 cups water to the boil and add the drained rice, salt, green cardamoms, saffron, cinnamon sticks, black cumin seeds, and lemon juice. Stir carefully to mix. Bring back to the boil, reduce heat and cook covered until the rice is half done. 4. 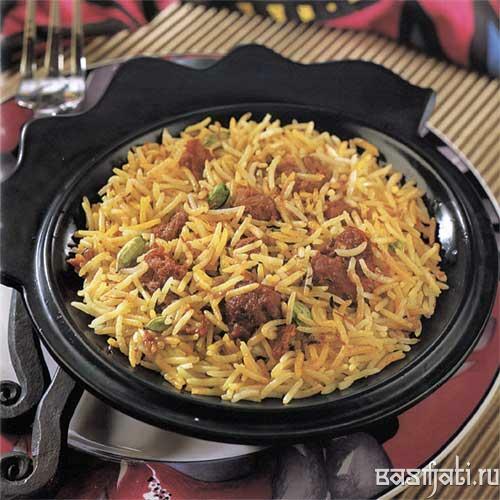 Layer as with other biryanis and place in a preheated oven (I70°C / 325°F) for 15 minutes.